Curriculum can be expensive but there are ways to cut homeschooling costs. We don't have to buy textbooks for each of our children. We can use other resources. Using a unit study and reproducible workbooks can help make homeschooling cheap. Sometimes unit studies do not work for a family. Our children might be in different age ranges or have different interests. So we will have to look for other ways to save. One way save homeschooling costs is to buy used curriculum. Look for used books in book stores and on the internet. Amazon sells a lot of different homeschool curriculum and books. Another place to find used books is to ask your friends if you can borrow something. The newest way to save money is to use e-books. Some curriculum comes as PDF that you can copy off. There are many books that you can download to your Kindle or other e-reader. Most are cheaper than buying the bound book. Some are even free. The internet can make homeschooling affordable. There are sites where you can find free worksheets and other printable items. If you do not have internet access at home you can still homeschool for free by using your public library. Most libraries have books, videos, and music. You can also use the internet at the library. At my library you can print from the internet a limited number of free copies each week. There are some pros and cons to using free curriculum. Before you decide to go completely free you will want to look at a scope and sequence for the grade that you are teaching. 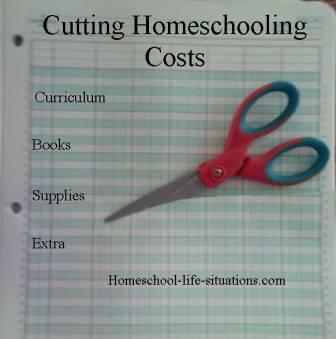 You can cut your homeschooling costs by planning. Think about the books and curriculum that your child really needs. In the early years you can teach your child a lot with handmade curriculum. Most homeschool supplies that you will need do not cost a lot. If you still think that homeschooling is too expensive, there are other ways to add to your homeschool budget. Sell curriculum that you are no longer using. Then buy books for next year. Have a garage sell. We all have items that we are not using and someone else would like to have. Work part time or full time outside of the home. Other parents have a home business. Yes, there are homeschooling costs. Curriculum can be expensive. Textbooks cost a lot. But with some planning you can cut your costs.